Clarke was nominated by President George W. Bush to be the Assistant Secretary of Defense for Public Affairs on April 5, 2001. She was confirmed by the Senate on May 17, 2001, and sworn in at a ceremony in the Pentagon on May 22, 2001. In the position, Clarke was responsible for U.S. Department of Defense public information, internal information, community relations, information training, and audiovisual matters. Clarke was the general manager of the Washington, D.C. office of Hill & Knowlton, a global public relations and marketing firm. She also previously served as President of Bozell Eskew Advertising, a leading issue advocacy and corporate communications company. From 1993 to 1998, Clarke was Vice President for Public Affairs and Strategic Counsel for the National Cable Television Association. In 1992, Clarke served as Press Secretary for the re-election campaign of President George Herbert Walker Bush. From 1989 to 1992, she was Assistant U.S. Trade Representative under Ambassador Carla Anderson Hills for Public Affairs and Private Sector Liaison. Previously, she served as press secretary to Congressman and then Senator John McCain. In 1982, Ms. Clarke was a press assistant to then Vice President George Bush. From 1979 to 1982, Ms. Clarke worked as an editorial assistant, photographer, and graphics editor for the Washington Star daily newspaper. Ms. Clarke holds a B.A. degree from George Washington University where she graduated in 1982. From U.S. Defense Department Biography of Victoria Clarke. Carla Anderson Hills alleged to be "Torie" Clarke's "mentor". ↑ 4.0 4.1 David Barstow, Behind Analysts, the Pentagon’s Hidden Hand, New York Times, April 20, 2008. September 11, 2001 : Attack on America, DoD News Briefing presented by Victoria Clarke, ASD PA 10:16a.m. ; September 12, 2001. The Avalon Project, Yale University. Victoria "Torie" Clarke, Assistant Secretary of Defense for Public Affairs, "Winning Women." 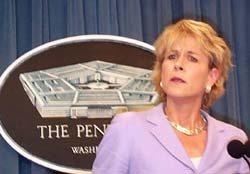 "Pentagon Spokeswoman Clarke Resigns," Associated Press, June 16, 2003.